This tray in the collection is another winner. Once again the bunnies and colors in this pattern are so pretty. I purchased multiple items and am pleased with all. The tray will be great for fresh vegetables or breads. 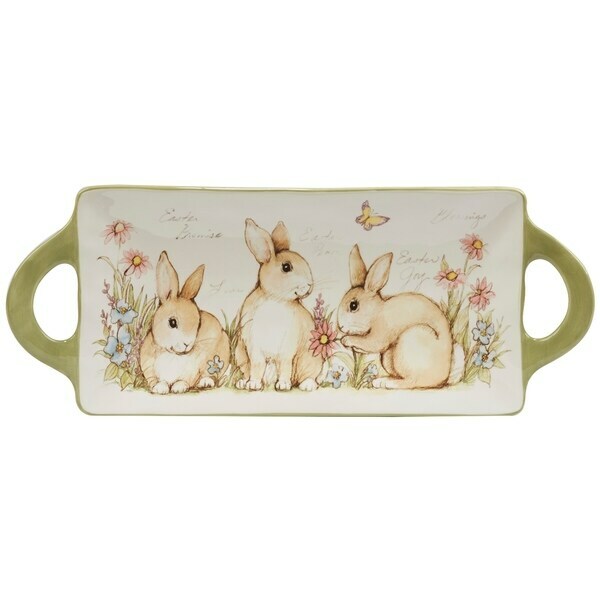 Celebrate Spring with these adorable bunnies surrounded by springtime flowers. There is an assortment of 4 endearing poses, along with coordinating toile and plaid patterns in beautiful pastel colors. The bunnies come to life on the 3-d candy dish, egg holders and salt and pepper! Dimensions 15.75 In. X 6.25 In. X 1.25 In. Very cute! Colors very spring like!